We’d love your help. Let us know what’s wrong with this preview of The Hero Two Doors Down by Sharon Robinson. But then Steve hears a rumor that an African American family is moving t Stephen Satlow is an eight-year-old boy living in Brooklyn, New York, which means he only cares about one thing-the Dodgers. Steve and his father spend hours reading the sports pages and listening to games on the radio. Aside from an occasional run-in with his teacher, life is pretty simple for Steve. To ask other readers questions about The Hero Two Doors Down, please sign up. Is this a good book that I should read? One of my reading themes this year is reading quality middle grade kids books. Two Doors Down by Sharon Robinson is the fictionalized account of the friendship between her father Jackie and nine-year-old Stephen Satlow. We go back in time to 1948 Brooklyn where all the kids drank egg creams, played stickball, built model airplanes, and idolized their favorite players on the Brooklyn Dodgers. Stephen Satlow is enjoying one of these normal childhoods, although because his father works 6 1/2 days a One of my reading themes this year is reading quality middle grade kids books. Two Doors Down by Sharon Robinson is the fictionalized account of the friendship between her father Jackie and nine-year-old Stephen Satlow. We go back in time to 1948 Brooklyn where all the kids drank egg creams, played stickball, built model airplanes, and idolized their favorite players on the Brooklyn Dodgers. Stephen Satlow is enjoying one of these normal childhoods, although because his father works 6 1/2 days a week, he tends to have trouble behaving in school, even getting suspended for ten days. His dream is to go to the Dodgers home opener, but he has to earn his parents' trust by behaving. His behavior and dreams take a turn for the better when the Robinsons move two doors down from the Satlows' home. The second half of this book builds Stephen's friendship with Jackie Robinson. Sharon writes quality messages for kids touching upon issues as how to fight back without fighting, team work, respecting one's parents and teachers, religious tolerance and prejudices, and how to be a quality person. She touches on issues from 1948 as the formation of the nation of Israel and subsequent war and the integration of the US Armed Forces. Jackie Robinson was at the forefront of these issues and along with the Satlows conveyed a positive message to Stephen about how to treat all people with respect. I had higher expectations for this book. There is no plot, just kind of some stuff that sort-of-ish maybe happened in real life. I thought maybe there would be some struggle to accept Jackie Robinson because of his race, but no conflict, no choices made. Which is fine, great for these people being so accepting, but makes for a boring book. All of the "life-lessons" are handed out by a lecturing adult, the child doesn't actually learn things for himself. There really isn't even enough historical I had higher expectations for this book. There is no plot, just kind of some stuff that sort-of-ish maybe happened in real life. I thought maybe there would be some struggle to accept Jackie Robinson because of his race, but no conflict, no choices made. Which is fine, great for these people being so accepting, but makes for a boring book. All of the "life-lessons" are handed out by a lecturing adult, the child doesn't actually learn things for himself. There really isn't even enough historical detail to really learn about this period of history. I learned more from 5 minutes of a PBS documentary about Jackie Robinson I caught recently. The only part that was really worth reading was chapters 9 and 10 about the Christmas tree, but it wasn't worth trudging through the rest of the book to get there. Maybe this book would have been better as a short story? And the set up of the book bothered me. In the first chapter, Steve is a young adult whose father has just died. He goes through a box of things his father saved from his childhood and it brings up memories of meeting Jackie Robinson. He is not remembering his recently deceased dad, but Jackie Robinson. Huh? While the adult in me was frustrated by the lack of plot (as another reviewer noted), I know kids (mostly boys, about age 7 to 10) will like this quick, based-in-real-life read. The author, Sharon Robinson, is the daughter of baseball great Jackie Robinson, and the book is based on the true friendship that her parents built with the Satlow family in the late 1940's. The afterward and acknowledgements are particularly touching: "Were you able to picture becoming friends with your hero? I wish tha While the adult in me was frustrated by the lack of plot (as another reviewer noted), I know kids (mostly boys, about age 7 to 10) will like this quick, based-in-real-life read. The author, Sharon Robinson, is the daughter of baseball great Jackie Robinson, and the book is based on the true friendship that her parents built with the Satlow family in the late 1940's. The afterward and acknowledgements are particularly touching: "Were you able to picture becoming friends with your hero? I wish that for all of you!" I have read this book and it is really good I love it. 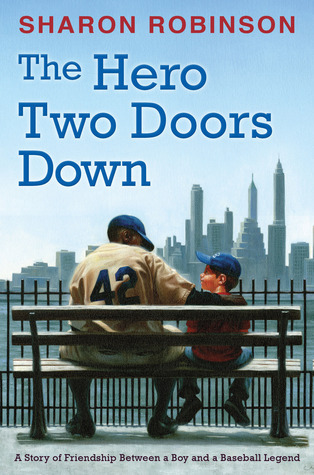 It is about a boy and a baseball legend that are friends, the boy is living in a place and then they move and they tell him that Jackie Robinson (his inspiration ) is living two doors down and they are friends and if you like this book you will like MY LIFE NEXT DOOR. I recommend this book because is really good and it made me feel like you are exited for the kid... Or the kid basically. It is similar to the one I told you because is like you love both but one is about love. The other one is about baseball...but is like the same... Maybe...I think so. Well this is the story in a shorter way. It is that the guy, Stephen is a loooooover of baseball player, Jackie Robinson. He knows aaaall about him,his birthday, his wife, his son, his touchdowns... Wait that is football but anyway. So like I was saying the boy is living in a place but he changes so he is in an apartment and then Jack or Jackie changes, two down of Steve! The kids loved the book and it was fun to discuss what it was like to live in the 1940's. It's hard for them to imagine life without a cell phone, let alone life where you can on I read this book to the students in my Sunshine State Club. It's the story of a boy (Stephen) living two doors down from his hero, Jackie Robinson in Brooklyn in the year 1948. The book was written by Sharon Robinson (Jackie's daughter) and is based on "the true story of a friendship between a boy and a baseball legend." Great story poorly executed. I was excited because my students read a Jackie Robinson book in tri 3 but I can only recommend this with reservations. It has a very "after school special" feel. The characters sound nothing like any person I know in their speech patterns. I will cautiously put it in my library and say, "You can enjoy reading this, but please don't write this way." This seems to be a theme with sports books. Every young athlete I read about (it seems) is all "Golly gee, I only want t Great story poorly executed. I was excited because my students read a Jackie Robinson book in tri 3 but I can only recommend this with reservations. It has a very "after school special" feel. The characters sound nothing like any person I know in their speech patterns. I will cautiously put it in my library and say, "You can enjoy reading this, but please don't write this way." 1948 was a great year for many people, but it was especially great for the young Steven Satlow. Written by Sharon Robinson, The Hero Two Doors Down is about a boy who has an iconic neighbor. In this sports fiction book Steven gets to see his favorite player every day, Jackie Robinson. The book takes place in Brooklyn, New York. Every boy's dream is to meet their favorite player, and Steven gets to do that every day. There were three main characters in the book: Steven, Steven”s father, and Jac 1948 was a great year for many people, but it was especially great for the young Steven Satlow. Written by Sharon Robinson, The Hero Two Doors Down is about a boy who has an iconic neighbor. In this sports fiction book Steven gets to see his favorite player every day, Jackie Robinson. The book takes place in Brooklyn, New York. Every boy's dream is to meet their favorite player, and Steven gets to do that every day. There were three main characters in the book: Steven, Steven”s father, and Jackie Robinson. Steven”s family, along with the other familie”s were not pleased when they heard that a black family was moving into their neighborhood. It was 1948 and most families were segregated like that, especially in an prominent white area in Brooklyn, New York. When Steven finds out that his neighbor two doors down is Jackie Robinson he is stoked beyond measure. Jackie Robinson was the best player for his favorite team, the Brooklyn Dodgers. Steven and his father read baseball magazines and listen to almost every game on the radio. Steve always dreams of going to games, but his father is very busy with work. Jackie is generous enough to let Steven and his dad come to opening day! It truly is a dream come true for Steven. I give this book a three out of five stars. I usually give any baseball book a five, but even though it was a good read, at times it got very boring. It was a short book too. Fast moving read. I like more of a slow paste, longer book with lots of detail. The author told a good short story, I enjoyed the interactions between Jackie and Steve. Jackie was a good buddy to Steve. All in all it was a good read. This book is for Baseball fans. A must for any child (or adult, tbh) who wants a good Jackie story! Great story of genuine love between families of different culture and race. This story serves as a reminder of looking beyond the differences and love people for who they are. This was a fun way to learn more about how Jackie Robinson was just as much a hero off the field as on it when he was in Brooklyn. I work for Scholastic and I picked this up from the giveaway shelf at work. I actually grabbed it for a cousin whose kids are Jackie Robinson fans and then ended up reading half of it on the train on the way home and then curled up on the couch with it this morning to finish. Read this to my boys. BL 5.0 and appropriate for all ages. I love baseball and Jackie Robinson is one of the 10 people I would have to dinner if I could. That being said, this wasn't a great book. It is a true story and written by Jackie's daughter, but the story likely isn't interesting to anyone that doesn't love Jackie. Good moral about friendship though. What I liked about this book is that it was about baseball and I love baseball. This book showed how bad and mean people were to different races a long time ago. Jackie Robinson was a hero to many and all he wanted to do was play baseball and he wouldn't let anything stop him. I also liked that Jackie made friends with a boy on his street and that would be really cool. He was a good role model for Steve and because of that he made better choices then the usual ones that got him into trouble. The Hero Two Doors Down by Sharon Robinson is an amazing book. This book is really interesting because the book is written by Sharon Robinson which is Jackie Robinson's daughter. I really liked this book because it is based on a true story of a little boy who knew Jackie Robinson and his family. If you like baseball this is the book for you. I would personally give this book five stars. I recommend this book to all ages. It is kid friendly. Book 13/15 for 2017-2018 EBoB: I did not care for this book at all. To begin with, the story opens with the protagonist, Steven, looking back on old baseball memorabilia upon his father's death, and mentioning their rocky relationship. The book then transforms into a flashback of the time when Jackie Robinson moved onto Steven's street, and how he learned so many lessons from Jackie and they became lifelong friends. The relationship between Steven and his father never appeared strained, even tho Book 13/15 for 2017-2018 EBoB: I did not care for this book at all. To begin with, the story opens with the protagonist, Steven, looking back on old baseball memorabilia upon his father's death, and mentioning their rocky relationship. The book then transforms into a flashback of the time when Jackie Robinson moved onto Steven's street, and how he learned so many lessons from Jackie and they became lifelong friends. The relationship between Steven and his father never appeared strained, even though, in the book's opening, that's how it was described. Throughout this novel readers learn so much about what being a good friend is like. Steve and Jackie’s relationship continues to grow throughout the story! When reading this book, you will see how strong Jackie and Steve’s friendship grows and how they stick together when times get tough or even frustrating. Throughout this book Steve and Jackie face many problems dealing with prejudice and standing up for your rights. Jackie and Steve continue to grow as friends because they stick together when Throughout this novel readers learn so much about what being a good friend is like. Steve and Jackie’s relationship continues to grow throughout the story! When reading this book, you will see how strong Jackie and Steve’s friendship grows and how they stick together when times get tough or even frustrating. Throughout this book Steve and Jackie face many problems dealing with prejudice and standing up for your rights. Jackie and Steve continue to grow as friends because they stick together when things get hard. Overall this story teaches a strong lesson of friendship and what it is like to be a great friend. This is an amazing read for kids in fourth grade and up. Throughout the story characters develop a strong bond and learn many lessons of friendship. Both boys and girls would enjoy this novel because they will be able to connect and relate to certain parts of the book. Friendship plays a huge part in this book. All through the book, characters learn what it is like to be a great friend and to always stay true to what you know is right. In this novel, both main characters face prejudice and have to stand up for themselves and what they know is right. Overall, many fourth grade students and up will enjoy this novel and learn many lessons on what it is like to be a great friend. First of all, this is a really cool story based on a true one: Jackie Robinson really did make friends with a young boy named Steven when he, his wife, and son moved into a predominately Jewish neighborhood during the early years of his career. Written by Jackie's daughter, Sharon, the book shows some really amazing interactions between the two unlikely friends and has a couple of really touching moments. 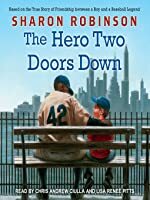 I think upper-elementary and reluctant readers who enjoy baseball stories will really like First of all, this is a really cool story based on a true one: Jackie Robinson really did make friends with a young boy named Steven when he, his wife, and son moved into a predominately Jewish neighborhood during the early years of his career. Written by Jackie's daughter, Sharon, the book shows some really amazing interactions between the two unlikely friends and has a couple of really touching moments. I think upper-elementary and reluctant readers who enjoy baseball stories will really like this one. This was an easy read, and I did enjoy learning a bit more about this friendship that the Robinsons had with a young boy that lived in their neighborhood. Kids who like baseball and historical fiction will probably find a lot to enjoy. But this book was just not for me. The dialogue felt awkward and narrative didn't have much of an arc. The best part was the misunderstanding about the Christmas tree, but a lot of the rest of it just kind of meandered without much conflict or structure. And I'm s This was an easy read, and I did enjoy learning a bit more about this friendship that the Robinsons had with a young boy that lived in their neighborhood. Kids who like baseball and historical fiction will probably find a lot to enjoy. But this book was just not for me. The dialogue felt awkward and narrative didn't have much of an arc. The best part was the misunderstanding about the Christmas tree, but a lot of the rest of it just kind of meandered without much conflict or structure. And I'm sure that's because a lot of it is based on real events, but I feel like this was maybe the wrong medium for this story.